Model release granted by Julie Stryker. 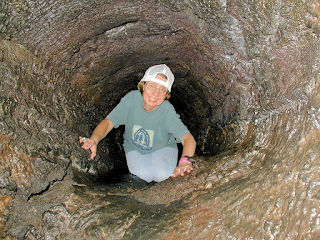 Trail of Two Forests, Julie in Lava Tube. Julie is crawling through a lava cast in this photo. Gifford Pinchot National Forest, Washington, USA. This is my wife Julie crawling through a small tunnel or cave, called a "lava cast." The cast was created when molten lava flowed over a fallen tree trunk. The lava hardened and the tree burned out, leaving tree shaped tubes in the rock hard lava. At Trail of Two Forests there were numerous fallen trees that the lava flowed over, leaving numerous caves and tunnels in the lava. It was pitch black where I took this photo (we didn't have a flash light handy), I told her to look toward my voice and smile! You crawl through using your hands to feel the way. If a bear is inside sleeping you get eaten. Julie had me go first! OK, seriously, no bears. Too many people, we had to wait in line to crawl through!